Just days before the show, the Intelsat+OneWeb ‘merger’ was announced (and financed by Japan’s Softbank). This deal ensured that OneWeb’s plans, plus those of other would-be constellation operators, were highly important topics for delegates to this event. However, this show unveiled a major surprise that was associated with Amazon founder Jeff Bezos, who was a star guest, by confirming that Paris-based Eutelsat would use a debut commercial flight of Blue Origin’s New Glenn re-usable rockets to launch a geostationary satellite in the 2021 to 2022 time-frame. 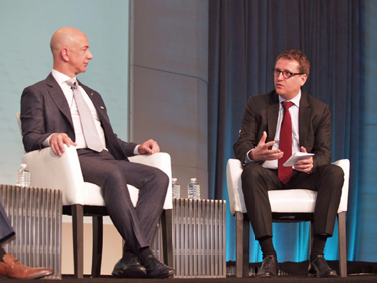 Delegates saw Bezos dramatically fill a missing chair on stage with Eutelsat CEO Rodolphe Belmer, which will be the first commercial user of the Blue Origin’s New Glenn rocket system. The 2021-22 launch target gives Eutelsat plenty of time to identify and order a suitable (probably) all-electric satellite and mission. Cynical comments—and there were a few—suggested that, while the industry constantly grumbles about “paper satellite” and their pesky filings, this was still a “paper rocket,” with much still to be done before billionaire Bezos and his team manage to get a satellite off the ground. 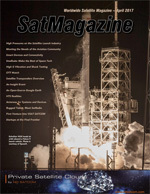 However, the agreement between Eutelsat and Bezos came as a welcome revelation to the show, but in truth, Eutelsat has always been aggressive in seeking out a good discount for a launch—even back in the Giuliano Berretta days, that company was quick to book a test flight or a debut option on a rocket—invariably at a bargain-basement price. “It’s very important to us to build up this kind of spirit because the relationship between a launch agency and a satellite operator needs to be intimate,” said Belmer. And the New Glenn vehicle is potentially nothing if not flexible. “The two-stage variant of New Glenn has quite a bit of capability: it can take 13 metric tons to GTO, 45 metric tons to LEO, and the booster stage is designed for operable reuse. The BE-4 engine is designed for a 100-flight lifetime. We put a lot of effort into letting the vehicle fly back with aerodynamic surface control instead of with propulsion,” he said. According to Bezos, the rocket’s design is what allows the vehicle to operate with solid availability, even in high wind conditions. However, Bezos stressed that his team have a speedy ‘return to use’ target of just 24 hours. Bezos said the New Glenn rocket would be one of the largest vehicles in service, which is one in the eye for Arianespace. Bezos explained that his trio of rocket designs (Blue Origin, New Shephard and New Glenn) each have different missions. The core Blue Origin/New Shepard versions are designed for ‘tourist’ flights to sub-orbital space and has “more than 1,000 people” working on the project. He emphasized the core thinking behind the systems and compared and contrasted a rocket with that of a modern aircraft, which would never be thrown away after a single use. Bezos showed demo clips of how a cargo or crew capsule could re-land at just 1.3 mph. A rocket’s (unmanned) landing looks much more violent but, in fact, comes down at 4.8 mph. Amazon founder Jeff Bezos and Eutelsat CEO Rodolphe Belmer on stage together at the DC show. Blue Origin has now flown five times—and the costs of maintenance after each flight? An amazing $10,000. Gwynn Shotwell, SpaceX’s president/CEO (pictured here), who also spoke at the show, told delegates that her company will likely launch six ‘pre-flown’ rockets this year (the first was SES-10, scheduled for around March 27). “And we’ll bring this rocket back, too,” Shotwell said. But SpaceX has suffered major delays following a catastrophic explosion on September first when the firm lost a rocket as well as the Amos-6 satellite. “We do anticipate re-flying about six vehicles and with pre-flown boosters this year, which should take some of the pressure off of production,” Shotwell said. Launching both the ‘pre-flown’ versions, as well as all-new rockets, almost side by side is vital if SpaceX is to recover some of their lost backlog—and their reputation. While all observers recognize the inevitable delays created by the September first loss, there are plenty of critics—off the record—who complain about the lack of transparent information—–and even misinformation—from privately-held SpaceX. Also key to an increased launch frequency are repairs to the extensively damaged Launch Pad 40 at Cape Canaveral which must be brought back into use. SpaceX had used the nearby Launch Pad 39A for their recent Florida launches—and used this Pad for the successful launch of EchoStar-23 in March. She also explained that inspection and refurbishing of the rocket now being used by SES took roughly four months to complete. That, she said, will in time drop to two months,and eventually to a single day, helped by continued investment in the design and build of the core Falcon-9’s first stage. “I think Elon’s [Musk] given us 24 hours, maybe, to get done what we need to get done, and it’s not a million people around a rocket scurrying like a beehive or an anthill. That vehicle needs to be designed to be re-flown right away,” she said. Bezos had also stressed that a dramatically speedy turn-around time was key to his strategy. The schemes really need to be successful. Among the existing operators, the show was replete with established satellite operators, all talking about their LEO/MEO plans, as well as those would-be players who also used this event to boost their own ambitions. As highlighted, the Intelsat+OneWeb+Softbank ‘merger’ was, without a doubt, the ‘talk of the show’. Intelsat’s CEO Stephen Spengler reminded delegates that Intelsat was a founding investor in OneWeb. “We made an initial investment in 2015 establishing a partnership with them to develop both Geostationary Earth Orbit (GEO) and Low Earth Orbit (LEO) services together as well as certain market segments. So, we have worked very closely with them over the last couple of years. As time has moved on, I think we have become increasingly convinced that there is a real opportunity to bring a new set of services to the marketplace that leverage both LEO and GEO network architecture and all of the services that could be associated with those. 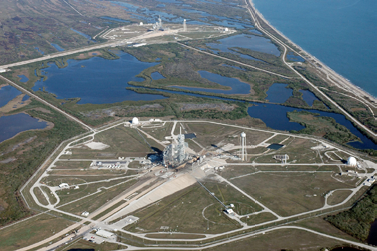 Launch Pad 39A at Cape Canaveral. “OneWeb and Intelsat recognized that we shared a vision for delivering affordable broadband on a global basis. I think that industrial logic developed pretty quickly. For an agreement of this type, there are a lot of details and a lot of work to put it all together,” he added. Even Mark Rigolle, CEO at LeoSat (and very much a futurist with his Polar orbiting/Laser satellite system), was happy to talk about a possible merger and the need to be open-minded, “Don’t be surprised if there’s an announcement one day that we’re combining,” he stated. However, while there was enthusiasm for this new LEO activity (from SES and Telesat of Canada, among others), there were also significant worries expressed over the four days of the show, not the least of which were from operators already standing in line for launches on the now, very crowded, manifests of SpaceX, Proton and even Arianespace. Artistic rendition of the OneWeb constellation. Image is courtesy of OneWeb. Giles Thorne, equity analyst at investment bank Jefferies, in his review of the show’s first day, said there was still plenty of skepticism over OneWeb’s prospects. 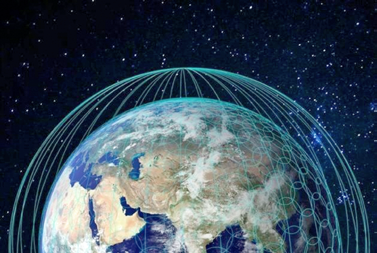 “Skepticism that OneWeb can get the regulatory approval, overcome the spectrum coordination and develop the adequately priced antenna to make OneWeb technically feasible—no-one is saying it won’t happen, but none are saying it definitely will. Strong reiteration from Intelsat of the industrial and strategic logic of merging the two businesses,” Thorne said. Another operator happy to talk LEO/MEO was Saudi Arabia’s Arabsat CEO Khalid Balkheyour, who said that despite rapid recent and current expansion plans, the company will, this year, look closely at further potential developments into LEO or MEO spacecraft. Balkheyour said Arabsat has expansion in mind, and not just in the firm’s traditional geostationary satellite role. “We have Request for Proposals (RFP) out now. 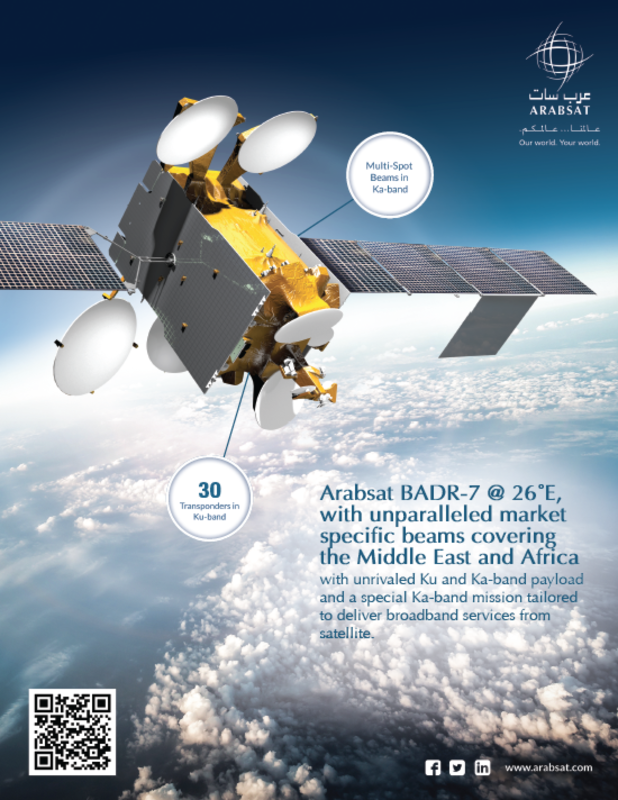 One new RFP is for Arabsat 6D and is under evaluation now, and this will be new mission and be placed at 44.5 degrees East, targeting data and it will be a high-throughput satellite for us and our partner (Taqnia Space of Saudi Arabia). It will hopefully launch by 2019. “We are constantly reviewing where we should go, where we should invest. There is no doubt for us that data, in all its forms, is important for the future. And this could take many forms, including backhaul and OTT. And this might include not just geostationary. 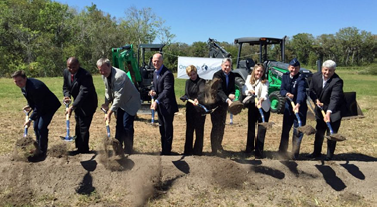 VIPs at OneWeb Satellite’s Ground-breaking ceremony in Florida, March 16. Although not formally present at the Washington show, SES also chipped in with their five cents worth on the topic of LEOs. Despite being committed to an extra eight O3b satellites being launched between this year and 2018 (into LEO), CEO Karim Michel Sabbagh was happy to be upbeat on ‘new technologies’. “We are very focused on how we want to deploy our time and resources. When I think about video, enterprise, mobility and government, we have a unique development path through our capabilities system, particularly when accounting for the upcoming GEO and MEO launches over the 2017-2020 window,” he said. We now know that OneWeb has far greater ambitions than their initial demand for as many as 900 satellites. Brian Holz, CEO at OneWeb Satellites (the j-v between OneWeb and Airbus), at the March 16 ground-breaking at the company’s new Florida manufacturing facility, talked openly about fulfilling 2,000 satellites from the new $85 million plant. Then there’s Google who, with SpaceX, are apparently working on a new, global-scale communication system that includes an LEO satellite constellation (over 4,000 satellites) and ground stations. Google has figured out the entire process to use the satellite constellation to provide high-speed, low latency, low-cost Internet directly to customers across the globe. Remember that Google last year invested $1 billion in SpaceX in return for a reported 10 percent stake in the rocket business. This is very likely to give it—at least—certain pre-emption launch rights when their fleet comes together. 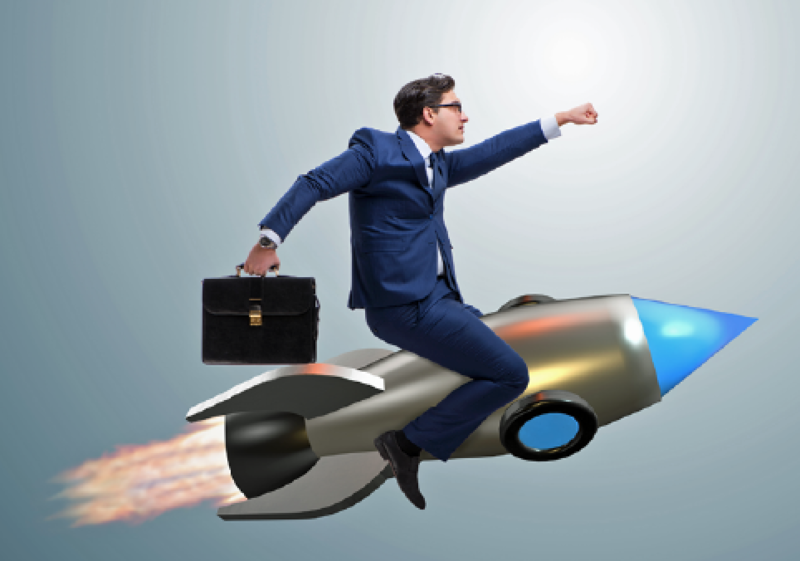 Soon after the investment was made, the inventor who was listed on the patent, Mark Krebs, moved from Google to SpaceX. 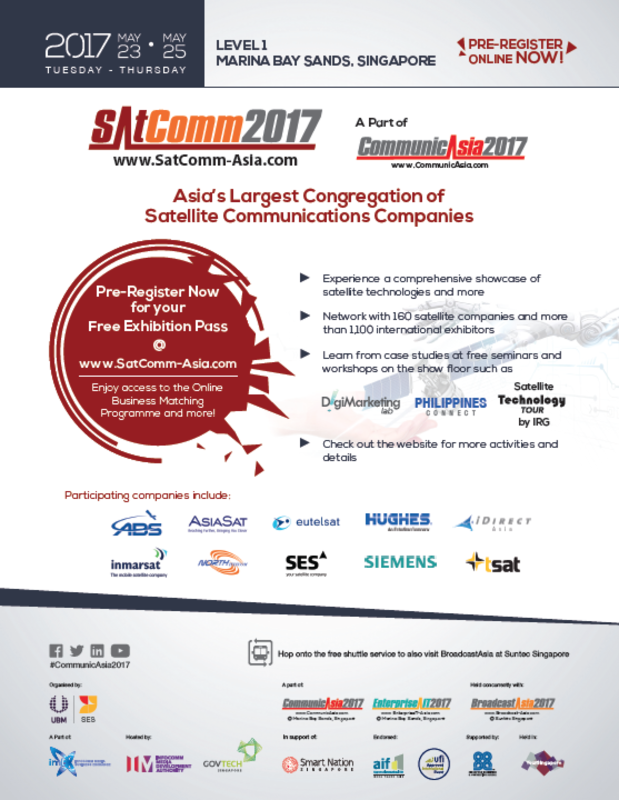 Then, in November of 2016, SpaceX filed an application with the Federal Communications Commission (FCC) to launch 4,425 satellites. 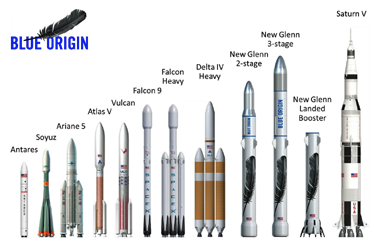 Here comes the big question: Who is going to launch all this hardware into space? The less-than handful of existing players (Arianespace, SpaceX, United Launch Services/Delta, International Launch Services/Proton, Bezos/New Glenn) are going to be busy. Yes, there are Chinese rockets, as well as a growing confidence from India’s rocket industry—Japan’s capability should not be ignored. There’s also the various Richard Branson/Virgin aircraft/air-launch schemes. However you slice and dice demand, the bottom line is that, potentially, thousands of satellites will need to be launched between now and 2025. Perhaps Bezos and SpaceX’s Elon Musk are truly sitting on a gold mine.